This updated guide is meant for anyone seeking to engage and collaborate with their neighbours and neighbourhood stakeholders to make their neighbourhood an amazing place to live, work, and play. The National guide includes new tools and resources and an Amazing Neighbourhoods network where you can hear how people are using this and other resources. Amazing neighbourhoods create conditions for people to meet their needs, to enjoy fulfilling, decent and respectful lives while enhancing the ecological, social and economic conditions of the neighbourhood. 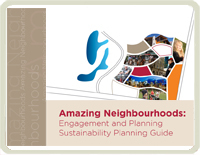 Although there is no one way to create an amazing neighbourhood, this guide identifies desirable outcomes, suggested steps, engagement strategies, and includes sample workshop designs, facilitators’ notes, tools, stories, and other resources to support the process. More specifically you can use this guide to lead a community or neighbourhood through a transformational change process that will help you create a new vision and action plan for your neighbourhood.